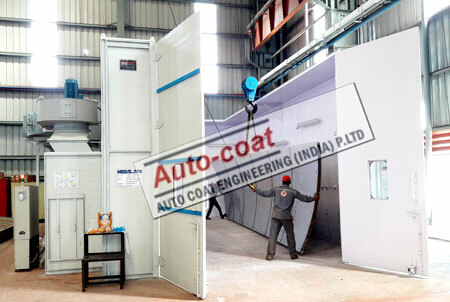 Autocoat Downdraft Booth are specially used for painting of heavy parts and large components, which are difficult to handle namely, wagons, earth moving machineries, chassis of vehicles, trailers, etc. In a DOWNDRAFT BOOTH air flows from top to bottom. And Air Draft is towards ground or to the exhaust chamber. The Wet Downdraft Booth can be single sided or double sided extraction chamber depending on the size of the component. Painter goes around the component to paint all sides of competence. The over spray paint particles exhausted are removed through grating & then to water tank. After turbulent action the paint particles are allowed to form a paint sludge & Paint Free air is exhausted to blowers and finally to atmosphere. Water Wash Downdraft Paint Booth is popular in mass production where paint consumption is very high. Such Downdraft Paint Booth requires Extensive civil work for Paint Booth as well as for Paint sludge removal system & hence are expensive. 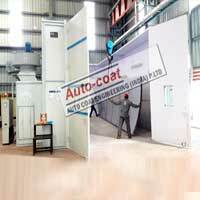 When Paint Consumption is low Dry Downdraft Paint Booth can be considered in a Dry Back Downdraft Booth Paint overspray are directed through metal baffles & replaceable filters as per Autocoat 4 level filtration to exhaust paint free air in the atmosphere to full fill pollution norms. Autocoat Dry Back Downdraft Spray booth with improved 4 level filtration system reduces recurring filter replacement cost to amazingly low when compared with competition. 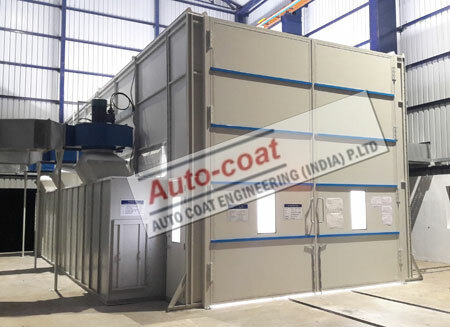 Autocoat experience gives lot of Downdraft booths options while deciding large dry downdraft booth or water type downdraft booth. Downdraft booths are also widely popular by names Downdraft Painting Booth, Dry Downdraft Spray Booth, Dry Downdraft Paint Booths & similarly, Wet Downdraft Paint Booth, Wet Downdraft Spray Booth, Wet Downdraft Painting Booth. Autocoat engineering selection charts and engineers teach the right methods while choosing a large downdraft paint booth or small downdraft booth. When the Product is of large size and unable to handle many times for painting purpose , downdraft booth comes as a perfect solution. 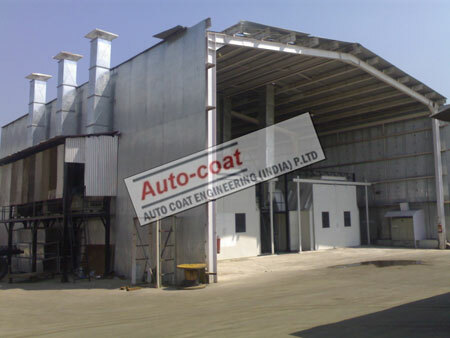 Autocoat has supplied a large no of downdraft booth in India , Indian made downdraft booths as well imported downdraft booths. Pit Type DOWNDRAFT BOOTHS requires excavation and additional concrete work. 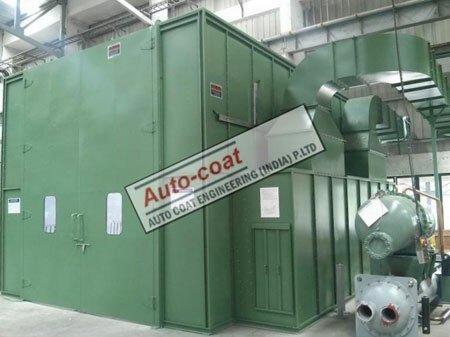 DOWN DRAFT SPRAY BOOTH can be connected in line with air supply units or air replacement units for better performance. Large Downdraft Painting Boothsare designed for hand spray of the largest types of work-earth moving equipment, tractors, locomotives, buses, cranes. Depending on the nature of the work, Large Downdraft Spray Booths may be either single sided or double sided and open partly enclosed of fully enclosed. 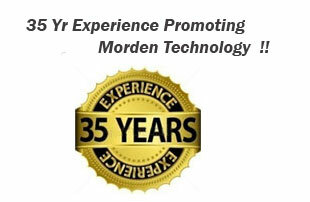 Airflow is vertical from top to bottom through an either an open roof or through an air replacement system. 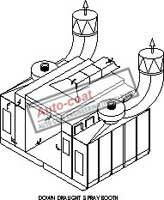 Depending on the work to be carried out in Large Downdraft Paint Booth and Different material handling equipment. 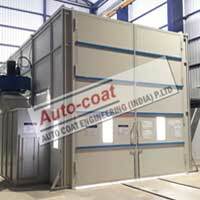 Open type Large Dry Downdraft Paint Booth is most popular & cost effective for all industrial products. 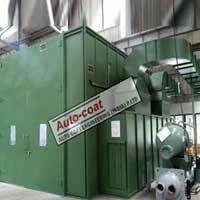 Speciality of Autocoat Downdraft Booth fulfils.